Shoe manufacturers used to believe that women who wore narrow and slim sizes were wealthy. So they made lots of styles in these widths. Now these women better be wealthy. There are so few choices for them, compared to the old days, that they may need to have shoes made by hand. Why? Who knows. But we’d love to hear you slender footed ladies describe your search. Maybe you’ll inspire shoe makers to build those narrow lasts again! I wear any where from a 9 to a 10 US size–foot measures 10.06 inches long, 3.31 wide for width ( actual width of toes), further down .5 inches below toes–3.44 inches wide, and 2.83 for the heel. What size should I order for the trotter’s Liz shoe? I am leaving town in two weeks. I have trouble with the width by the toes and the width of the heel fitting. I don’t understand your description of your foot measurements. Just to clarify, the “width” of the your foot measurement is the WIDEST part of your foot, not your toe area. And, regrettably, it has been a long time since shoe manufacturers paid attention to the width of your heel, it is assumed to be in proportion to the length of your foot and the width at the “ball” of your foot. So I’m going to take you for 10.06 inches long and 3.44 inches wide. You are pretty close to a perfect 9.5 N.
I’m also not clear on what “trouble” you have with the toe and heel width? Too wide? Too narrow? If you like your shoes a little wider, go for a 9.5M. If you like them roomier in the toe, go for a 10N. 2. My knowledge that Trotters does a very good job of making shoes according to the size specifications used internationally. I do hope this information reaches you in time for your trip! My foot measures 10 inches long and 3 and a quarter inches wide at widest part of largest foot. Is that 10 and a half, narrow? Some narrows are a bit tight in the toes, but mediums are so wide in the heel, I can’t keep them on my foot. I do okay with flats, but when the heel is elevated, it is hard to keep them on. Thanks for your help. With a length of 10 and width of 3.25 puts your size as 9.5 Narrow (N or AA). What size are you currently wearing now? Since the narrows are tight in the toes but loose in the heels then you may want to play around with insoles and possibly heel grips. Full and half insoles offer different levels of support and no insole will create the perfect fit without trial and error. If you send me your email address I would be happy to mail send you some full insoles to play around with. Remember you can always trim the insoles. Email erica AT designershoes DOT com. If you are looking for stylish flats in size 9.5 narrow here are some lovely options. The Naturalizer Shoes are known for their comfort more than style but that has been changing over the last few years. The Naturalizer Violette Pewter Mettallicare a stylish ballet flat with a buckle detail. I have a daughter who is 13 and wears an 11.5 to 12 narrow width. Do you think you can help me to find her a more modern shoe than they have in the stores and more of an variety? We have so many options to choose from! Our website features a very wide variety of sizes & widths including narrow, slim and extra slim, so no worries on finding the right size and style for your daughter. If you were looking for a dressier option, may I recommend Trotters Janna? 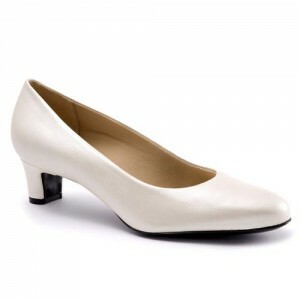 Such a simple, classic heeled shoe would be perfect for a 13 year old. The Trotters brand offers narrow widths in sizes up to a womens 12. For a little bit more style and warmth, I would like to shoe- I mean ‘show’ you (I’m very excited about these) the Softwalk Dani boots. These ankle boots are very ‘in’ right now and they make a perfect present this time of year. If, however, you are more interested in casual, yet classy looking shoes- one can never go wrong with a great pair of flats such as the Antia Abella shoes in black. Although simple, they are versatile enough to go with any outfit, for almost any occasion. Happy Shopping!